A black-tie gala to benefit Big Brothers Big Sisters agencies throughout Florida. Inspirata is defined as “divine influence or action on a person that leads to artistic or spiritual development,” and this year’s Dream Journey-theme invited guests to leave the real world behind and float into the fanciful, all while raising money for a great cause. 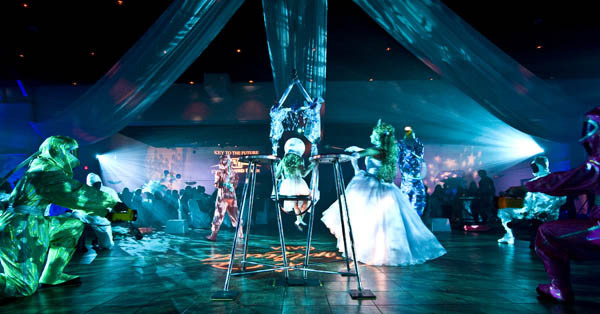 The event featured a live band, a dance troupe, custom-created stage show, gourmet dinner, silent auction, and VIP room. Guests to the 2008 Inspirata Gala were greeted by a world void of color. Muted greys, champagne, and black filled the pre-function space, where Grand Events created custom fabric columns, draped with elegant champagne fabric. An over-sized black and white Big Brothers Big Sisters framed photo hung from each column, reminding attendees why they were donating their time and money to be at the event. Guests made their way through a dark tunnel, filled with swirling lights, into the ballroom, where a whole new world beckoned. The ballroom’s main feature was an elaborate ceiling treatment, with elegant white fabric spanning out to five points in the room. The dinner tables showcased one of six centerpieces, all created exclusively for the event. The bars were even brought into the Dream World, as a life-size bed hung over one, and lighted bubbles hung over the other. No detail was left unturned as Grand Events brought the client’s dreams to reality for an incredible charity event. The Link Event Professionals hired Grand Events to do the decor for this signature event.